Two more Marvel stars just got stuck in the Spider-Man: Far From Home web. Alongside Tom Holland's web-slinging Spidey, Samuel L. Jackson will reprise his role as Army veteran and S.H.I.E.L.D. 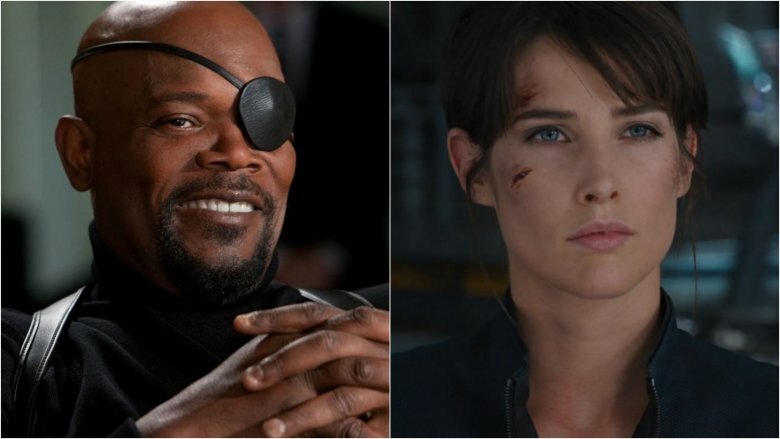 leader Nick Fury and Cobie Smulders will step back into her character Maria Hill, former S.H.I.E.L.D. deputy director. The news comes to us courtesy of Vulture (not to be confused with Michael Keaton's villainous Homecoming character). Fury and Hill were last spotted crumbling away into strange space particles in a post-credits scene in Avengers: Infinity War. Spider-Man also bit the literal dust in Infinity War, dying in Iron Man's arms and yanking on everyone's heartstrings in the process. Before Jackson appears in Far From Home, he'll bring a digitally de-aged, eyepatch-less Fury to the Marvel Cinematic Universe in Captain Marvel, starring Brie Larson as Carol Danvers. We aren't 100-percent sure whether Smulders' Hill will have a role in the Anna Boden and Ryan Fleck-directed film, but there's some strong evidence that suggests she might. For one, Hill was with Fury in the Infinity War post-credits scene, during which the camera panned to show Fury's pager decorated with a red and blue sticker and an insignia that's unmistakably Captain Marvel's. And secondly, the 1990s-set Captain Marvel features Clark Gregg's Phil Coulson — another super important S.H.I.E.L.D. member — so it only seems right that Smulders' Hill would also be a part of the story. The only thing better than two S.H.I.E.L.D. agents is three! Fury and Hill could embark on any number of adventures in Far From Home, which sees Holland's Peter Parker go global and face off against villains like Mysterio (reportedly played by Jake Gyllenhaal) and that pesky Vulture (Keaton is said to be coming back for the sequel film). According to Spider-Man: Homecoming director Jon Watts, Fury was actually supposed to mentor Peter Parker in Homecoming, so perhaps Far From Home will also see America's Top Spy join Robert Downy Jr.'s Tony Stark in steering young Spidey in the right direction. Spider-Man: Far From Home, which also stars Zendaya as Michelle "MJ" Jones and Marisa Tomei as Aunt May, will swing into theaters on July 5, 2019.